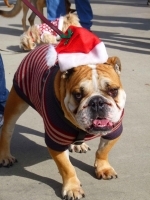 November 20, 2011 (El Cajon ) – ECM editor Miriam Raftery snapped these images during a “Jingle Paws Walk” sponsored by El Cajon Animal Center for Education and Services (ACES) Foundation. 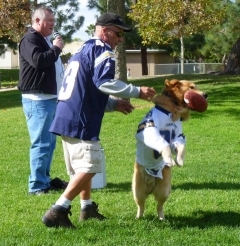 A new secret weapon for the Chargers was revealed: “Air Bud”, golden retriever of Disney movie fame put in a special guest appearance to demonstrate his athletic prowess. 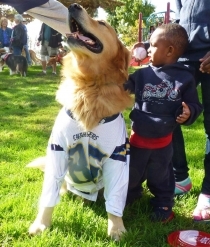 Actually, this is the son of the original Air Bud, thanks to the wonders of frozen DNA. 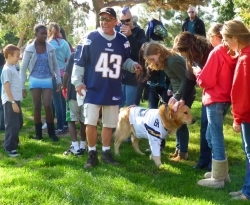 After Air Bud tackled the task of catching a football and running it down a makeshift field, kids lined up to meet the famed four-footed star. 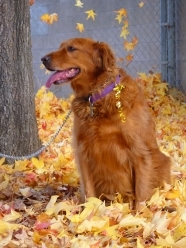 Our editor brought along her own golden retriever, Penny, who romped through a field of golden leaves from a liquidamber tree at Wells Park, resplendant in fall foliage. Monica Marusceac was on hand with Hank, another local media celebrity. 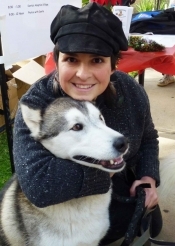 The Husky dog underwent thousands of dollars in medical care to treat a broken leg, after which Marusceac adopted Hank. His surgery was paid for by ACES, since the dog’s prior adoptive owner was unable to afford the medical bills or the cost of new fencing that would have been needed to keep Hank from jumping out of the yard. Fortunately, Marusceac already owns other huskies—so Hank is now happy in his newfound pack. The shelter now seeks an adoptive home for a Pomeranian that also suffered two broken legs. The dog was found and taken to a local veterianian, where he is now recovering. Some dogs camed dressed for the Jingle Walk in holiday finery, from sweaters to antlers to yes, jingle bells. The event also included vendors, dog rescue groups with animals needing good homes, an agility course for pets, and more. 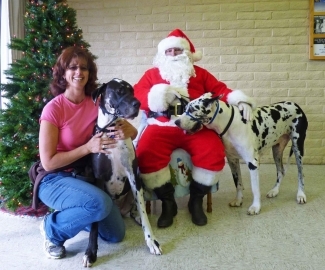 One additional special guest--Santa Claus--stopped in to pose for photos with pets and their owners, including a pair of Harlequin Great Danes that managed to make even Santa look petite! 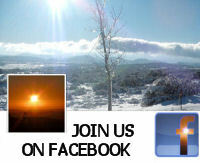 If this looks like a doggone good time to you, bring your dog to next year's Jingle Paws walk! If you don't have a dog, you can adopt one at the El Cajon Animal Shelter, which has lists of adoptable pets posted at its website.